Sean Anders is on the rise with comedies that feature quirky family dynamics from his two most recent films, Daddy's Home and Daddy's Home 2 and now with his latest addition, Instant Family. It is inspired by the Bryant family but in this adaptation the couple take on three foster children, not five. Mark Wahlberg (Pete) and Rose Byrne (Ellie) play a young couple who flip houses for a living. They don't have any children but a remark from her sister sends Ellie down a rabbit hole of googling children that are up for adoption which, of course, leads to Pete and Ellie signing up for training. Octavia Spencer and Tig Norato compliment each other perfectly as a comedically dynamic duo trying to coach the various couples into how to be the perfect foster parents. At the heart, the film is incredibly sincere using the comedy as a way to make a narrative that at first look seems incredibly serious into a lighthearted family film but it doesn't sacrifice itself to the genre. It certainly has its fair share of laughs, don't get me wrong, but it also has its endearing moments that'll evoke a tear from you at appropriate moments. Byrne & Wahlberg have fantastic chemistry together which allows them to springboard off each others personalities well and create a wonderful on screen relationship with the kids who play their foster children. Isabela Moner plays the oldest of the three, Lizzie, a teenager with fire but is at the heart incredibly emotional and just wants her family to be secure. Gustavo Quiroz and Julianna Gamiz play the younger children, Juan and Lita, who add to the comedy with Lita's unruly behaviour and Juan's clumsy scenarios he continually finds himself in. Instant Family is a perfect watch for people who want an all rounder film that doesn't take itself too seriously. I loved how easy it was to watch, it didn't once take you out of the narrative and it was just incredibly enjoyable from start to finish. See it with the biggest audience possible and soak up the joy of this wonderful family. 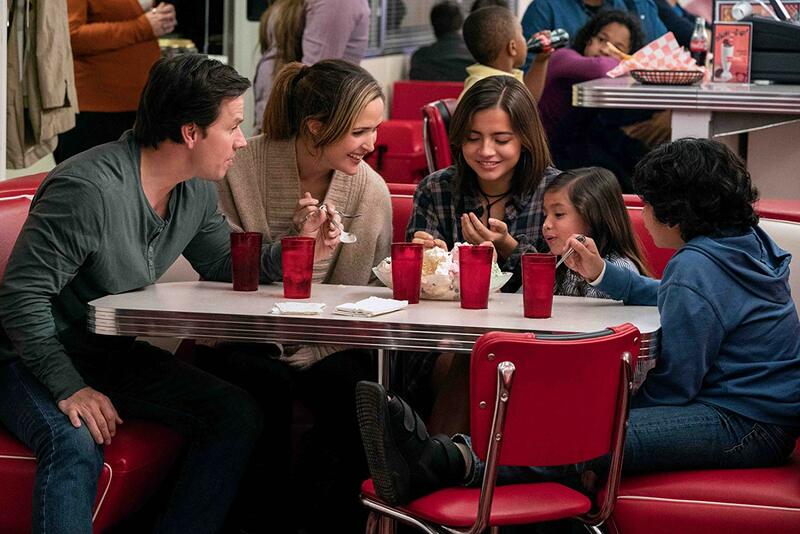 Instant Family arrives in UK cinemas 14th February 2019.